A devout and dedicated devotee for nearly sixty years, Mrs. Rani Subramanian, who originally hails from Tamil Nadu, came to Bhagavan Baba as early as 1950. Eighty five years old now and fondly called 'Rani Maa' by Bhagavan, her life is a treasure-chest of scintillating experiences from yester years. A sincere spiritual seeker, she currently resides in Puttaparthi and shares her elevating memories to eager devotees with deep conviction, insight and faith. I got my first Divine call in 1950. I was then in Nagpur (in the state of Madhya Pradesh, Central India), not in the South, so I had no opportunity to hear about Swami. It was Ms. Kamala Sarathi, a devoted lady who is like a sister to me, who first told me about Swami. 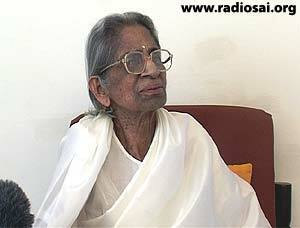 When she was in Delhi, she heard about Swami through a person who was teaching her music. 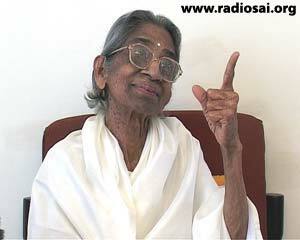 This person was a classical singer who used to sing in Prasanthi, and he told Ms. Kamala that she must go and see Baba. So, that is how Mrs. Kamala Sarathi came to Swami first, and she returned very impressed with His Presence. Everything about Puttaparthi touched her very much and she wrote to me saying, “The next time I go, you must come because you are really missing something! He is a very great Soul! He is supposed to be Bhagavan.” At that time we did not have the conviction that He was God. So we waited for hours and finally, got into the bus. There were about 10-12 of us, as apart from Mrs. Kamala Sarathi and her two music masters, my sister’s children were there too. When we landed in Bukkapatanam, it was almost 11 in the night. Then, from there we had to take a bullock-cart to come to Puttaparthi, as in those days, that was the only transport available. But actually we had to walk, because the bullock-carts mainly carried luggage and very small children. They said: “As far as possible, all the adults may please walk, and we will take the children, because they can’t walk for two hours!” There were no other bullock-carts there either, because it was too late in the night! So, by the time we reached Puttaparthi, it was at 1 o’clock in the night! It was pitch dark! There was no road; like a forest there were just cart-tracks, wide enough for a cart to go, bouncing up and down on the stones! It was quite an experience for me as I had never been to a place like that before! It was so dark that we couldn’t even see. Then, the music master Mr. Chidambarair (he used to play the violin for Swami’s bhajans) said: “Don’t worry! Swami is with us.” And suddenly we saw a ball of light in the sky! It was like the moon, but very big! In any case, we were fine and we reached at 1 in the night! Frankly, Swami’s Abode was very unimpressive. There were no properly built walls or gates or any proper structure! There was no proper garden either, only thorns and ant-hills everywhere. There was a big shed there, meant only for devotees. And at the end of the shed was Swami’s shrine. It was His altar, where His chair was kept. There was no separate room for Swami. They used to put a curtain in the middle, like a partition, and the same place would also serve as Swami’s altar. That’s where He would come and sit for bhajans. At the end of the bhajan, they would pull the curtain, and we are all there in the same shed. And Swami’s real room, a tiny enclosure, was in the courtyard, where there was a well. So, that night, in that darkness, suddenly we saw somebody; it was Baba! How did He know we had arrived? He came from that shed, with a big, long torch! And He flashed it on us. There was a big grill-door, not a wooden door, which He opened and then flashed the light to see who had come. Spiritual life is different from our worldly life. Similarly, spiritual behaviour too is poles apart from worldly behaviour. Once you come to a Guru, you can’t do what you like! That is what Swami was trying to tell us through this incident. 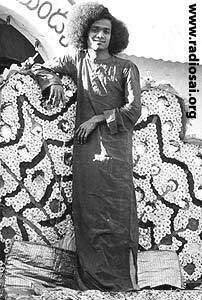 My sister said, “Swami, you don’t worry, we have got everything; we are alright.” He said, “If you are fine, then you sleep now, and I will see you in the morning.” And He left. In the morning, we went in and settled down. Then, Swami came to where we were. In those days, Swami would be in and out of that shed any number of times. He would come at anytime – 9, 10, 12, 2, or any other time – and go around talking very informally to everyone constantly. There was no discipline required. You could ask Him any question at any time you wanted. He was always available! So, He came in the morning at 8 or 8:30, and said, “You are all well-settled.” He also said there was a waiting room and we could put our bed and trunks in a small area there. There were hardly 20-30 devotees there, so it was actually no crowd at all. Also we realised that He was a difficult Master, but a very Great Master – meant for a very few people who are willing to face whatever He says! And He said we should not try to understand Him. I find in my own case, that understanding comes when you are humble. Our intellect is of no use; it’s foolish! How can we understand Bhagavan? To understand Divinity, that Grace has to come from Him! And that Grace comes when we do perform, that is, lead our lives according to His Guidance. So, when Swami came, she asked, “Swami, why are You ignoring my other sister? You haven’t even asked who she is! Why are You doing this?” He said, “I have a reason. I know her feelings and thoughts. She is not comfortable here, in this atmosphere, or with My Form. She thinks ‘His Hair, His Robe! I have not seen anybody like this!’ She is feeling a little strange. I felt He was giving me His kripa (Grace); His aura to help me settle! Because He can give you those good vibrations, to settle our minds, as He is everywhere; inside and outside, it is only Him! So, Swami went back, and a few days after that He told me to come for an interview. He called me alone and took me to another room. During those days, there was no interview room; but next to this room, there was another room, which was also like a shrine. When it would rain, the water would get into the shed! There was no window, but through a gap, the water would get in and all our things would get wet. Then, we would have to shift! And where could we now go and sit? There was another hall – not very big – where all the devotees would crowd and sit, because there was no place to lie down! That was also like a shrine – they had put some grass for Swami and some other material. 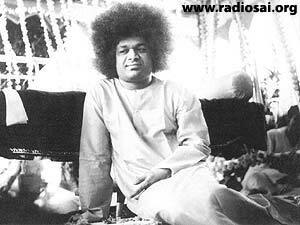 But Swami would not sit there for bhajans, He would sit in the shed only! So, sometimes, He would take people there for a private interview. What I am trying to convey here is that, at that time I didn’t understand all this because I was not open to a spiritual life! Spiritual life is different from our worldly life. Similarly, spiritual behaviour too is poles apart from worldly behaviour. Once you come to a Guru, you can’t do what you like! That is what Swami was trying to tell us through this incident. He was preparing us to that state of acceptance. We got the message straight away – “If you want to follow Me, you have to follow the way I want you to follow Me. You can’t say ‘Swami, I will stay for 10 days only!’ You can not take decisions!” He made it very clear. And now, I have got several experiences, and I am convinced that once I start following Him, it is going to be an arduous path, because there will be opposition. But if you want Him, you have to be prepared for all that! People may make all sorts of remarks, but if you love Swami, you must bow your head and be prepared. It came to us that He is not an easy Guru to follow; but if you want Him, you have to adopt this path; He is not going to make any compromises for us. He will tell us exactly what He wants. Whether we obey, or disobey, is up to us and we will reap the consequences accordingly – blessings for obedience, and no blessings if we disobey. So, I accepted that, and after that, He started talking to me and everything was alright. In those days, we had to go to the hills for morning ablutions. There were no bathrooms. So it was a very difficult time and Baba made us taste all that to test our devotion to this path! If you are devoted, you can bear hardships and any inconveniences without grumbling! The mosquitoes were biting; there were no fans; and all sorts of things could happen, for example, the rain could get all your things wet, but you have to be calm. But if you are complaining, there is no merit; only de-merit. Acceptance is merit! That came to us very clearly. Also we realised that He was a difficult Master, but a very Great Master – meant for a very few people who are willing to face whatever He says! And He said we should not try to understand Him. I find in my own case, that understanding comes when you are humble. Our intellect is of no use; it’s foolish! How can we understand Bhagavan? To understand Divinity, that Grace has to come from Him! And that Grace comes when we do perform, that is, lead our lives according to His Guidance. If you follow whatever He says, Swami says, you don’t have to read a book. In Prasanthi Nilayam, He once came to our room. Those days He used to come in and out of our rooms, and sit, eat and play with us; it was a very close relationship. So, one day He said, “You are reading so many books!” We asked, “Then Swami, what should we read? We also want to educate ourselves, as we don’t know much about spiritual life.” We thought all this reading would help. Then He said, “Read the lives of the saints, you will get the message. All this is of no use! It will just give you a heavy head. 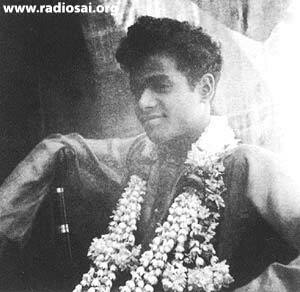 Once, He came into our room in Prashanti Nilayam – in those days, He used to come and give us talks in our own room! We didn’t have to go into any interview room. And we were allowed to go to His room too, anytime we wanted. He had given permission to certain devotees to go upstairs to His room, and we were among them. Even though I had this privilege, I didn’t want to take undue advantage of this precious opportunity, and run up to His room every time I had a doubt, because He would come to our rooms too, and then we could ask Him. 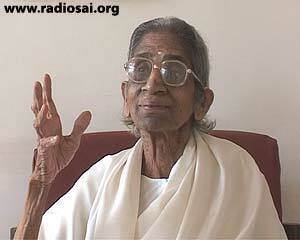 I have another sister who is a Bramhacharini, who didn’t marry because she was seeking God; she was our fourth sister. She and I were in the room, and Swami came into the room. He looked at us and said, “You are not convinced yet that I am God, right? You have got doubts about My Divinity, is it not?” He asked us a straight-forward question.